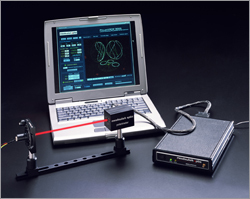 A useful laboratory and manufacturing tool, the LCPM-3000 Polarimeter covers various applications, from aligning optics to measuring optical retardance or optical activity. The LCPM-3000 accurately measures the Stokes Parameters that quantify the State of Polarization (SOP) and then graphically displays this state on the Poincaré sphere, polarization ellipse or running stripchart. It contains no spinning waveplates, motors, or other moving parts to wear or cause vibrations. Applications include test and measurement, pharmaceutical development, Quality Control and telecom device manufacturing.